the Dodge family stands out by virtue of its wealth being primarily concentrated in the hands of its women for many decades. These ladies owed their financial good fortunes to two brothers, Horace Elgin Dodge and John Francis Dodge, who started out in business manufacturing parts for other auto companies (becoming major shareholders in Ford Motor Company along the way) In 1914 they began building vehicles under the Dodge name. Lucrative government contracts during the industrial buildup to World War I (plus selling back their shares to Ford for $25 million in 1912) made the brothers astronomically rich. While they had no hesitation spending their wealth on expensive toys for themselves and their families, neither was able to enjoy their riches for long, dying within months of each other in 1920.
their lakeside mansion, to a private dock where their yacht the Delphine (named after their only daughter) was berthed. Rose Terrace lay next door to the Detroit Country Club. That did not mean the Dodges were initially accepted as members, however. For as rich they were, Detroit society looked down at the crude manners and brash personalities of the Dodge brothers. While being snubbed by the old Guard didn’t bother them a bit, it galled their wives. Anna, who loved music, encouraged Horace to donate heavily to the Detroit Symphony. She also convinced him to purchase a mansion in Palm Beach where the east coast elite took a more benevolent view of colorful characters from the hinterlands (especially those with unlimited coffers). It was there that Anna and Horace’s pretty daughter Delphine met and became engaged to James Cromwell, son of legendary Philadelphia socialite and reigning “Queen of Palm Beach” Eva Stotesbury. With that impending connection, the holdouts in provincial Detroit had no choice but to capitulate. 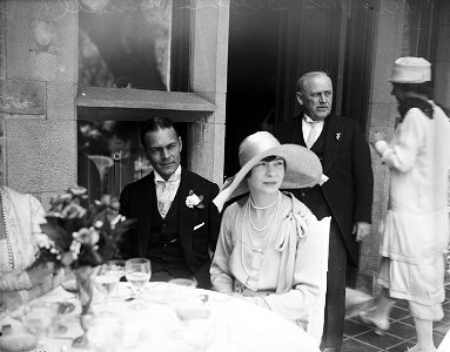 3000 guests representing the apex of Detroit and Philadelphia society rubbed elbows at the lavish Cromwell-Dodge wedding reception held at Rose Terrace in June of 1920. When Horace died in December of that same year, he left his share of the Company to Anna. Already accustomed to a life of luxury, it would soon enough expand to regal proportions. The Delphine was replaced by a newer larger version that Horace had commissioned but had not been completed before his death. In 1925 Anna and her former sister in-law Matilda sold Dodge Motors for $146 Million (the largest cash transaction in history at that time), becoming two of the richest women in the world. Under the guidance of legendary dealer Lord James Duveen, Anna began buying European art and antiques. She also upgraded her Palm Beach residence, purchasing a 100-room mansion named Playa Riente. In addition to a hefty commission, the handsome realtor who arranged the sale, a former actor named Hugh Dillman acquired a far more lucrative prize the next year when he married Anna the next year, in May of 1926. She would later say it was Hugh (fourteen years her junior), who really taught her how to enjoy her wealth. Anna began amassing a peerless collection of jewelry worth more than $6 million. That sum did not include her famed pearl necklace, however. She had only worn it two times before giving it to her daughter Delphine. The beautiful and impulsive Delphine, with her stylishly bobbed hair and chic frame, represented the “Modern American Woman” in the eyes of the nation’s press, who faithfully chronicled the details (real and otherwise) of her flamboyant life. she became the first woman to win the President’s Cup at the APBA Gold Cup boat race in 1927. Not long after Anna took on a second spouse, Delphine was thinking of shedding her first, as her marriage to James Cromwell was crumbling. The striking couple divorced in 1928. She did not stay single for long, marrying Raymond Baker, a banker twenty years her senior and former husband of Margaret Emerson Vanderbilt that same year (James eventually found solace in the arms of “the richest girl in the word”, marrying Doris Duke in 1935). As a wedding gift, Anna commissioned society architect Horace Trumbauer to design a new home in Washington DC. for the couple. The resulting 30 room adaptation of the Hotel Rothelin-Charolais in Paris was heralded for its sublime proportions and elegance. Its salon is still considered by many to be the most beautiful room in the city. This was not the only project Trumbauer was working on for the Dodges at the time. Lord Duveen had been trying to convince Anna for several years that her neo-Jacobean mansion was not a proper setting for her growing collections of French furniture and objets d’art. Anna had Rose Terrace razed and asked Trumbauer to design a “petit palais” similar to Miramar, an earlier work of his in Newport that she greatly admired. Her only request was that her version was to be bigger. Trumbauer did not disappoint. As construction neared completion in 1932, it was clear that Anna would need to find more to fill it. Off she went to Europe with Dillman in tow, buying art and antiques by the boatload on a multi-year shopping spree (including another $2,000,000 to $3,000,000 worth from Lord Duveen himself). Along the way she took a fancy to England, and purchased a mansion called St Leonards near Windsor in 1932, which she had totally remodeled. In 1935 the new Rose Terrace, fully furnished and decorated, was ready for its formal debut. Even the most discerning critics and jaded aesthetes had to admit the finished product was a work of art. That same year Delphine and Baker’s stormy marriage, marked by frequent separations and reconciliations, came to an end with Baker’s death. True to form, Delphine married another banker, Timothy Godde, several months later. She moved out of the Washington mansion to settle down in Rye, NY. Anna, who held the title, turned around and leased it indefinitely to Delphine’s former mother-in-law Eva Stotesbury for a nominal sum. Eva had fallen on hard times (relatively) and Anna had remained loyal to the woman who helped put the Dodges at the top of Society. If anyone hoped that Delphine’s move to Rye would signal the start of a quieter life, they were mistaken. Delphine continued to provide the press with headline fodder, most notably when she had a very public romance with Irish Prizefighter Jack Doyle beginning in 1937. Delphine went as far as taking up residence in Reno, intent on divorcing Godde and marrying Doyle. At the last minute, right before the divorce action was to be heard, she went back to Godde in 1938. Soon afterward she was named as the defendant in a $2 million alienation of affection suit by film actress Judith Allen, whom Doyle had divorced for Delphine. Within a few years, Delphine’s fast lifestyle, fueled by alcohol abuse led to a rapid decline in her health. She died in 1943 her husband at her side in Rye, leaving behind a daughter from each of her first two marriages (the pearl necklace went back to her mother). Anna had settled into the stately, predictable life of one of Palm Beach and Detroit’s leading hostesses. Divorcing Dillman in 1947, she took back Dodge as her last name. As the decades marched on, she continued her gilded age lifestyle well into her eighties. Most of her excitement and headaches in her later years probably came from Delphine’s two daughters, Christine “Cee Cee” Cromwell and Anna “Yvonne” Baker Ranger, whom she was constantly having to bail out financially. In 1954 Cee Cee Cromwell, then 31 and on her fourth husband (she eventually married 5 times) unsuccessfully sued to have Anna and the Detroit Trust company removed from control of the family trusts, claiming that her grandfather’s money (which she expected to inherit a fourth) was not earning the rate of return it should. She had good reason to worry. In order to fund her lifestyle, she had already sold shares against her eventual inheritance to 250 individuals and firms totaling $3 million. By the early 1960s, Anna ended her annual migrations to Palm Beach (she had sold Playa Riente in 1956) and was living full time at Rose Terrace. Despite her luxurious surroundings, Anna’s favorite activities were simple ones in her later years. Confined to a wheelchair the last 7 years of her life, she preferred singing hymns with her minister, watching TV on an old battered television set and listening to Guy Lombardo albums, as opposed to hosting lavish dinner parties or attending charity balls. She died at Rose Terrace in 1970 at the age of 100, in a metal hospital bed that had been set up in her bedroom full of exquisite French furniture. The bulk of her estate was left to three grandchildren of her son Horace Jr. Delphine's daughters Christine and Yvonne were cut out of the will. An accounting of her estate later revealed claims filed against Christine by over 600 creditors totaled more than her $11.9‐million inheritance, while Yvonne had borrowed more than $6.5 million directly from Anna in addition to the $1.3‐million she owed to the bank (Anna had also given the Catherine the Great pearl necklace to Yvonne in 1968, who split the five strands up amongst friends and family, eventually reuniting 3 of them to sell at auction for $800,000 in 2008). and The Delphine which still sails around the globe. Combined, they give a tantalizing hint of the incredibly rich lives of these two women.